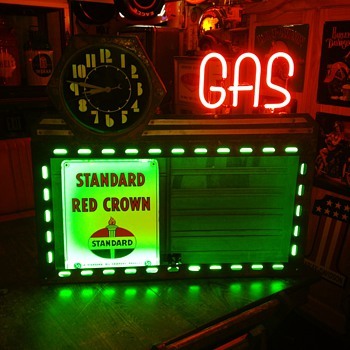 In Signs > Neon Signs > Show & Tell. This is a one of a kind neon sign that I picked a couple of weeks ago in Michigan. As I was driving home the sign got broke so I took it in and got it repaired and just got it back today. 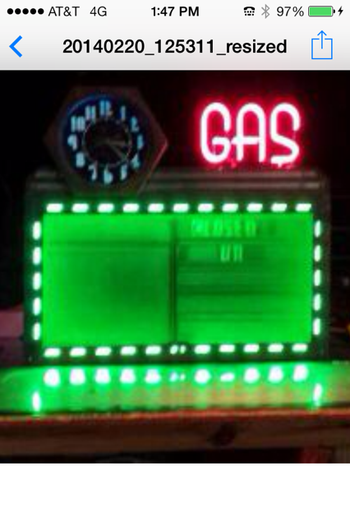 The clock has blue neon and the border is green neon and the gas letters are pink. The sign is 30" x 33". I put a 1950's Standard Oil pump plate in it temporarily till I decide what will look the best. Another great sign brought back to it's glory. Looks incredible Michael, very nice pick! Thank you chevy59 for the love and the great compliment! Awesome sign,and a hexagon Cleveland to boot! Don't get much better than that! Thank you mtg75 for the love and the compliment! Love it Michael. You always find some awesome stuff. Gotta love anything that lights up and looks this good! Looks fantastic with its "life" back! What a great pick! Three neon colors. Looks great in your collection. Thank you walksoftly for the love! Thank you fortapache for the love! Thank you Daddy_Nobucks for the love and the nice compliment! Next time I'm in Michigan I'll call and see where you live. Have a great weekend! Thank you geo26e for the love! Thank you oldnfuelish for the love and the nice comment! Thank you crazycharacter for the love! Thank you DrFluffy for the love! Thank you Chevelleman69 for the love and the nice comment! Hi Michael, love your collection. Thank you rikanddonna for the love and the great compliment! Thank you Nova for the love and the nice comment! Thank you rustyboltz for the love and the great compliment! Thank you Longings for the love and the nice comment! Thank you blunderbuss2 for the love! Thank you leighannrn for the love and the nice comment! Thank you Aimathena for the love! Thank you Designer for the love and the nice comment! Thank you smiata for the love! I love, love, love, love your items....and love, love Neon!! Thank you farmlady for the love and the nice comment! Thank you doynger69 for the love! Thank you petey for the love! Thank you pw-collector for the love! Have a great weekend! Cool. I'd love a neon sign! You must have a lot of space to keep these things officialfuel. 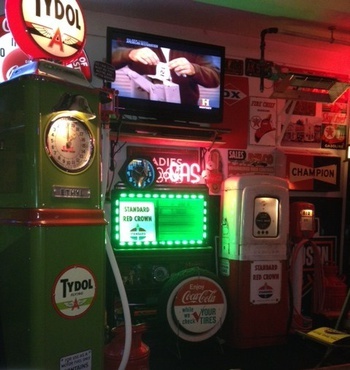 Love your comment of buying junk & selling antiques, lol, don't all dealers do that? Thank you Vintagefran for the love and the nice comment! It's gets pretty crowded but there's always room for another collectible. lol Have a great weekend! Thank you antiquerose for returning to the scene of the crime and hitting that love button! :-) Have a great weekend! Thank you toenail2 for the love! Welcome to CollectorsWeekly. Have a great day! Thank you straightleg for the love! Have a great week! officialfuel you must have a big place to store these items. Thank you chev59_99 for the love! Thank you Zowie for the love! I have a couple of garages. There's always room for something else. Things are always changing around here. Again thanks for stopping in! Thank you Zowie for the nice comment! Have a great week! Thank you mtg75 for hitting the love button again! Thank you vanskyock24 for the love! Thank you Lady_Picker, mikelv85 and snowman3 for the loves! Thank you MountainGirl for the love! Thank you SteveTx76 for the love! Thank you rikanddonna, battlegear and AntigueToys for the loves! Thank you vintagegirl66, Jewels and ttomtucker for the loves! Thank you CindB for the love and the awesome comment!! Have a great week and good luck on your next find! Thank you usedcarlady for the love!